Exactly what I wanted! Perfect color & the right weight for the summer! Create a calming oasis with the Madison Park 'Piper' coverlet set. This beautiful collection features a watercolor floral print across the center of the coverlet that dissipates to solid ivory on the top and bottom. Three decorative pillows play up the soft purple and taupe hues to pull this collection together. The quilt is made so poorly I just can’t find the right words. For 1 it is not made straight, from the design that should be centered on the bed, I have like 10 inches hanging over and on the other side like 2 inches. It’s so pretty and coordinated and everything goes together just perfectly. It’s very pretty but going to be sending back. Very nice. Wished the print pattern went 18 inches further up towards the top. This looks very pretty on my guest room bed and the accent pillows really set it off well. It is just the right weight for summer. The reason I didn't give it 5 stars is that the pretty design end half way up the bedspread so I'm happy it came with accent pillows. I purchased this quilt set for my master bedroom and I love it! The colors match my room color perfectly as well as a picture I had hanging over my bed. 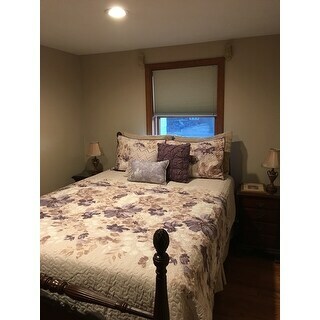 The quilt and shams are very good quality and the pillows were the perfect added touch to the bed. I would definitely recommend the Madison Park brand. The color is almost spot on with what you see on the screen. It may look like the base color is white, but it is indeed a nice taupe/cream color. As mentioned by others, the floral design is only on the bottom half of the spread and the top half is just quilted taupe. IT works though because the accent pillows add enough up top. If the floral was all over it would look too busy. The coverlet is soooooo soft. I had no idea it would be so soft even after washing (but I let it air dry mostly). I have a queen size bed and the sizing was perfect for a little "hang over" on the sides (but not to the floor). The shams are great and also soft. From the picture I thought the accent pillows were tacky, but when you put it all together on your bed it grows on you. The random zig zag print pillow somehow breaks up the prints nicely and it just works. 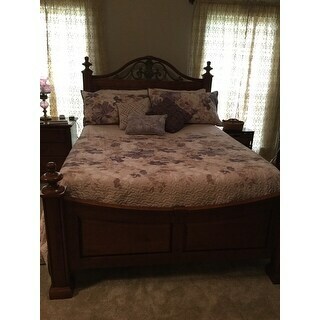 I would certainly recommend this set to anyone for a guest room or even your master bedroom. I needed a light coverlet set for my bedroom for the summer/spring because my other set is too heavy for the warm months. This set is perfect and I use it without having a flat sheet underneath. It keeps me cool in the summer but warm enough if the air conditioner is on. FANTABULOUS purchase! Also shipped very quickly with standard shipping. 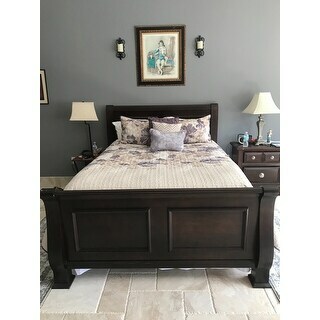 I looked at literally hundreds of sets, for my new bedroom with beige/tan walls...white trim...yet kept coming back to this one...and I am so glad that I finally went for it! Beautiful set! Is exactly like the pictures...the different purple hues mixed with taupes, beiges, and creams, are perfect! The quilted coverlet is soft...not too thick or thin, so can be paired with a blanket in the colder months, and simply sheets in the warmer. Unfortunately, it's not really oversized on the sides, but that is our bed! We have a king with several layers of toppers, due to back issues, so it's abnormally high...and I will definitely need a bed skirt. But, matching any color in it will be easy enough to do, and lovely! I'm sure most people, tho, would find it sufficiently sized for their beds, and, the men not feel that it is too feminine for them, by simply perhaps using more neutral pillows, than comes with the set. (Which are really pretty, too!) Would definitely recommend! Even more BEAUTIFUL then shown!! Fits perfectly over my 4 inch memory foam. The pillows that come with are an added touch. Its light wt for summer nights. I bought it for winter to since I'm always warm so its a perfect match for me! This is a beautiful quilt set with lovely colors. It is soft and durable at the same time. It is floral but not too feminine. My husband loves it too. We purchased a grey blanket and two sets of sheets, one lavender and the other dark purple and it looks great in our master bedroom. We have dark wood furniture and light grey walls. My first order from Overstock and I’m thrilled with the quality and fabric ! Just put hardwood flooring in these bedrooms and needed new coverlets! They are fantastic! This set is perfect for this King sized bed. Excellent quality and colors are true to website. Well worth the investment and can't wait to find the perfect headboard to match. Nice quality. Easy to wash/dry. Looks great!!! Couldn't be more pleased ! It's everything I hoped it would be .the colors are true to what you see . The fabrics are high quality. This has been one of the easiest purchases I've ever made - affordable , reliable delivery , completely satisfied. What a stress free way to shop and end up being completely happy ! Can't wait to shop some more ! Perfect for the re-do on our guest room. Goes well with the current color of the room and a new lamp I purchased at a resale shop. After having a darker cheap looking comforter, this quilt style spread was a delight. I love the lavender, purples and browns. Stitching is good, lays flat and easy to make the bed. As others pointed out the design does not go all the way to the top but the pillows and turn down make that not an issue for me. Here it is on a queen mattress. Ready to do the wall art now!! Love this coverlet. It looks just like the picture. Soft and comfortable, just the right weight for spring and summer. Looks the same in person as it does in the picture. Love this and the pillows add so much! Great product for the money! This quilt is beautiful! The muted purple and taupe colors accent our Master Bedroom walls of cream and gold and match our curtains perfectly. The fabric is so soft without being too heavy or bulky. I loved it so much I am buying another as a spare. Bought this for my mom and she just absolutely love it. She said she’d live ti hzce this in different cooors if available. The shipping es also extremely fast. Beautiful coverlet. Bought a king for my tall queen bed. Fits great. Oh my gosh, I love this quilt! The colors are just so beautiful and soft. The quilt itself is so soft. I couldn't believe it when I took it out of the back. I have purchased a number of quilts because I just couldn't find one with everything...this one is everything. Great colors, comfortable on the bed, and I love it! "Does anyone know how to purchase the flowers and vase on the left end table?" No, unfortunately matching curtains are not available. "2 Questions: I am concerned about the fabric being polyester has anyone had issues with pulling or snags ? I have cats Also length on the king covering the mattress with a few more inches hanging down past the mattress. " I have three dogs that are on my bed and constantly and I have not had any snags whatsoever. It is soft and very well made. I am very happy with this purchase! I absolutely love this coverlet set. 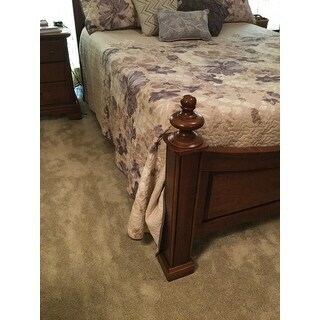 It is durable, yet soft; light weight, yet enough to drape well over the bed. The colors are vibrant, yet soft...don't know how else to explain that one. I am very happy with the quality of this set. I have a cat and have had no issues. Mind you, Oliver gets his nails trimmed weekly by me. Second question about length. I do not find it too short for my King bed. I do layer my bed to make it work. SO worth the purchase......it's gorgeous. "i am thinking of using this for an AirB&B how well will it hold up to many washes?" We have washed it several times and it's held up. I use a low filler soap for a high efficiency washer. Using a no filler soap is the key to keeping any clothing/products from falling apart. "Hi @Mimi1434 Can you please let me know where have u got matching purple dust ruffle.Thank u to in advance." This style bedspread does not come with a bedskirt/dust ruffle. You may be able to purchase one separately in a complimentary color at Overstock or anywhere else. Hi. I got it on Overstock.com. Its beautiful. "This will be for a full sized platform bed with drawers. The mattress is a memory foam 10" thick. I thought I would order full/queen. It would be tucked in rather than hang free. Having never done this before, do you think it will tuck okay and not be too bulky?" I have a large memory foaming mattress and my de is pretty high. I put a purple dust ruffle it. It looks even better. I love it, so many complements on it. If you need to know where I got the perfectly matches dust ruffle or a picture of my bed just let me know. I think it would tuck in okay, as it is not terribly thick. It would require a "fold" on the bottom corners, but even then, I think it would work. The fabric is quite "fine" and soft--reminding me a bit of silk in its feel. Because of that, it might snag more easily than some fabrics, but I've not had that problem with mine yet--and I have to tuck mine down between the mattress and my metal bed frame. Yes. I think it will be fine. It is a nice quilt. Not thin but not bulky. I really like it. "I have a queen size bed and it seems people are buying the king size because they say it may be too short....I wouldn't want that but at the same time will it be way too big?" I have a queen bed as well and did buy the King Size. I love the way it fits far down on both sides to the bed. The only issue is the pillow shams are obviously for king size beds so you really can't put the shams side by side. I just put one in front to the other and it works fine. 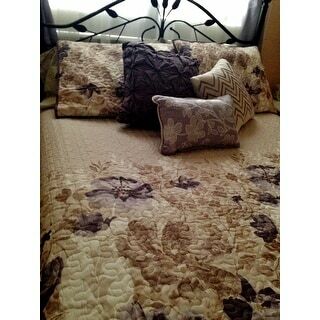 This really is a wonderful coverlet.... very good quality and super soft. I wouldn't hesitate in buying. I ordered a size up as I read the reviews about the size being off, was a bit apprehensive at first, afraid it would be too big. It fits perfectly on my queen sized bed! I would recommend sizing up. it really is a beautiful set! 'Piper' coverlet set. This beautiful collection features a watercolor floral print across the center of the coverlet that dissipates to solid ivory on the top and bottom. Three decorative pillows play up the soft purple and taupe hues to pull this collection together.